Just a small disclaimer before I proceed, this is not the cheeriest of posts ever, but I have my friends blessings and permission to share. She believes, through her pain, perhaps a life can be saved. I pray I can do her story justice. I will try (to the best of my ability) and let God Himself convey the rest. “In deciding upon my best course of action for my untimely demise, I discovered that I had never recovered from the tragedy fourteen years ago!” My friend blasted, point blank. Her statement caught me completely off guard, and I nearly spit my tea. I think I sat wide-eyed, jaw agape for what seemed like an eternity. My brain was a whirlpool. As thoughts floated by, I grasped at what I could. The need to tread lightly was imperative. I could react, freak out, and think she was just as crazy as the other nuts. I could try to talk her out of such nonsense. Or, I could hear past my reactions to the truth of her statement. First off, I knew she wasn’t crazy. I had seen this lady in action. She could pray the bark of a tree, for others. She could hold the world on her shoulders, for others. That was the key, for others. Never for herself. She could cheer the world with a smile, but never herself. She wasn’t crazy, just deeply hurt. I knew that. Secondly, if I tried to reason with her, telling her how precious she was, how the absence of her presence would leave a gaping hole, she would not hear me. My words would be last week’s garbage. However, that was not the point of her statement. Option three: I could hear what my friend was saying to me. Yes, she was talking about death, again. But it was the second statement that held the weight. Here was a woman who was beyond amazing, but tragedy had befallen her at her hands and she just could not move on. I think part of the real tragedy was the fact she could not talk about it. I knew her well enough to know she was searching for a friend, some place she felt safe. She needed someone she could trust. Judgment was harsh, and she refused to put herself in that situation again. She was far beyond reserved in these matters. She tried previously. Well-meaning people, she thought she could trust, always dashed away. I felt her pain. I didn’t even know if I had what it took to hear her out. “God give me the strength I need to be a friend. Give me the stamina to stay. Give me wisdom when to speak and when to be silent.” I prayed. She sat there, across my kitchen table from me, eyes cutting directly into my soul daring me to speak. This soul-cutting stare was her “can I trust you?” test. My next words were not my own. “You may be right,” I said. “I’m caught in between my cave and the surface. This is not a safe place for me.” She said next. Here was someone I trusted. Someone I looked up to. Someone I depended upon; our roles reversed. Her “cave” was the walls beyond walls that she built to keep the world away from her heart. Hurt had pierced her heart; those walls kept it just her and Jesus. The “surface” as she called it, was when she glossed everything over, put on her smile, and held tight. On the surface, she prayed for others, was an encourager to others, and felt as normal and happy as a sad person could. No one was aware. She kept it that way. Jesus knew. Being “caught in between” meant she felt trapped in some seriously real emotions that demanded attention that she could not give. She fought for survival like a raccoon falsely accused in a trap. “God, help! What can I do? I can barely manage my life let alone be a friend to such sadness. What do I do?” I prayed fervently. This woman was MY prayer shield. She had MY back at every turn. I’m not half the prayer warrior she is. Why couldn’t she just pray this one through on her own? I’m cruel, honest, but harsh. Here is where the big thought comes into play. Who prays for the prayer warriors when they cannot pray for themselves? Who lifts the arms of those who raise their arms in battle, especially when no one knows they struggle? I’ve always viewed the prayer warriors as invincible. I figured they never had issues. “I need prayer. Fighting down on your knees, sword in hand, ready to fight, type of prayer.” She was drop-dead serious. 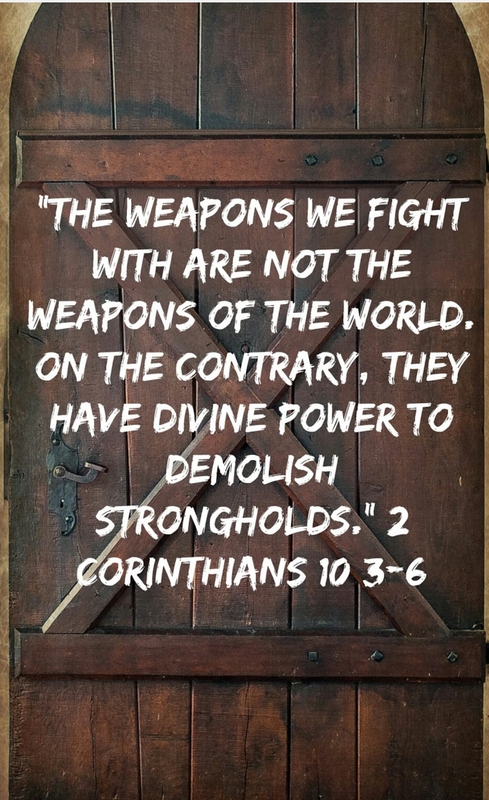 Here’s what I know–if the enemy, seeking to kill, steal, and destroy, can take away those who are willing to fight on behalf of others, he finds himself victorious. Here’s the truth. Even the strongest get wounded. They get back up and continue fighting. Those that keep standing up in battle have a huge target on their backs. The enemy prefers them to stay down, wallow in self-pity, rolling in the muck of defeat. Christ died to make us more than conquerors, overcomes in this life. My friend has a long journey ahead of her. This war is not against flesh and blood. The path to healing is rough. It will hurt. Bad. She’s a prayer warrior, though, and those called to pray are tough as nails. Right now we are praying against the chains of fear that have her vocal chords strangled. A spirit of fear is not an option! So, if you haven’t noticed, I haven’t written much lately. I’ve been battling some things, demons, evil spirits, spirits of addiction, etc and so on. And yesterday I came to a head and just broke down and cried out and said to God, “I’m tired Lord, just tired, why does it have to always be me? Why do I have to be the strong one? It’s not fair, why, why, why?! ?” Yup just have a regular tantrum with the Lord. After I was finishing being a crybaby, I thought to myself, He is probably saying right now, “if you only knew and understood why you wouldn’t be asking.” Either I thought that or He was telling me that. So this morning I always listen to sermon while getting ready for work. Today it was the 2nd part of a Dr. Jeffers sermon. As I pushed play I heard, ” you ask Him why? Why am I going through this? Why me? And the answer is because He’s God and because He can.” I laughed out loud because I knew that was Him sending me that message after my tantrum. Dr. Jeffers went on to say, “we think that God is being mean to us because we struggle or go through trials, but He’s preparing you, and He don’t want us to be a rare steak, or medium rare, He wants us to be well done! He will keep you in the fire until you are done and He’s ready to take you out of the fire!” And again I laughed because He got me again. See my struggles are with my older son. I’ve been praying and rebuking these evil demon spirits of addiction who have gotten a hold of him. And sometimes I get tired but I know all I have to do is call on the Lord and use the divine powers He has given us to demolish these strongholds. I’m asking all of you followers to please pray with me, for my son, that he be delivered from these strongholds of addiction. United in prayer and using what He gave us, we can crush those demon spirits! Amen? Amen! Guest Post The Smells Of Christmas / Mike McInerney Ministries. year is the smells of Christmas. Cookies. Turkey or ham. Pumpkin pies. whiff and was taken back in time to when she was still alive. Aren’t scents powerful? Smells are powerful and God uses them. for her? What did she and Joseph smell in that b arn? people. Animal smells. Real life smells. God the Father chose to bring Jesus into a place dominated by real life smells. years on the earth: real. Joseph and Mary with gifts for Jesus. EVERY knee will bow; EVERY tongue will confess. light, then grass and then cows. under the threat of death. So they flee. It doesn’t seem very victorious, does it? which is called striping, and allowing the exuded resin to bleed out and harden. sweeten the odor of burnt up sacrifices. That is sobering to me. Myrrh has been used as an ingredient in anointing oil that has had many uses. on behalf of all Jews) and myrrh: a burial spice. This verse was written about her son. A king. A sacrifice. A death. she know that He came here to die – to die in her place….to die in my place…. because satan had touched a man’s heart to do what satan loves most: to kill. Tabernacle had all three. Later, the Temple would have them too. showing some of the big picture. made – because of man’s sin. were offered to God…because of man’s sin. to die…because of man’s sin. This sacrifice, God giving Himself up because of man’s sin, took away man’s sin. said to be precious to God. God, this is a sweet aroma to God. It smells good to Him. – just because of the relationship between him and God. What does all this have to do with us….here….now? the earth: the Temple in Jerusalem. and not just because Jesus had become the ultimate sacrifice for man’s sin. Temple on Temple Mount in Jerusalem: sacrifices, but with a difference. be because our sins have already been completely washed away – for good! God for all He has done. They are to be a celebration of His touch on our lives. our lives, to God in thankfulness. temple and the sacrifice, in how we live our lives. This smells good to God. like this: “I AM crucified with Christ”. make sure we get ours first? reborn to die and experience resurrection life over and over again. Continually. When we live sacrificially we are the sweet aroma of the knowledge of Christ. Let’s do that. Let’s walk in love…..like Jesus did. them smell just like Jesus to me. families, friends, brothers and sisters in Christ. What do we smell like to them? What spiritual scent will they remember in us? they sense Jesus in someone else will remember us? Jesus. God promised He would complete what He started in us. Keep this in mind whenever you wonder how easy it can be to reach your destiny. In order to understand this principle, you must get into the right mindset to prepare for what God is about to call you to do. If you are needing help with this or know of someone who may need this message of inspiration and motivation, feel free to take a look at the following questions below. Why are you afraid of being launched into your destiny? Nobody has the power to stop you from reaching your destiny unless you give them the power. Your failure to launch comes from the fears and doubts that you have taken in from yourself and other people. If you never leave your comfort zone, you cannot be launched into your destiny. You cannot lift off if you are willing to let fears hold you back from realizing your destiny. What will happen when you are launched into your destiny? There are countless possibilities to what can happen when you are launched into your destiny. Here are three additional facts that can help you figure this out. There are no guarantees as to what the results will be when you are launched into your destiny. When you are launched into your destiny, it is your opportunity to prove that you are worthy of it. You are launched in your destiny for a particular reason or purpose that must be fulfilled. As you can see, despite not knowing all of the particulars, being launched into your destiny is something that has been planned just for you. When the time is right, you will arrive in the moment to show the world why it is your time. Tell or show you what He wants out of you. This will be done through visions, other people, and even in print. Ignore the opinions or advice of other people. God will not seek any consul from anyone because He already knows what they know and then some. Give you what you need to be successful. God will prepare you by providing the people, resources, and the path necessary to become successful. Put you where you need to be in order to fulfill your destiny. God will guide you and place you accordingly in order to achieve your destiny. Is there proof in the Bible that God has helped someone fulfill their destiny? Although there are several examples where God has helped people to fulfill their destinies, I will share with you one good example of how God has already put these steps into action. In Exodus, God wanted Moses to fulfill his destiny by freeing the children of Israel from Egypt. Here is how He did it. God sent an angel onto him into a flame of fire in the midst of a bush and called out Moses to tell him that he will be sent unto Pharoah to free the children of Israel out of Egypt. Whether it was Moses who doubted the plan, the children of Israel who were angered, or Pharoah who did not believe in God, God ignored it all. God gave Moses spoke words of encouragement, gave him Aaron to help with speech, and a rod that transformed into a serpent. God was there every step of the way guiding and putting Moses in positions to succeed, and despite receiving a multitude of setbacks, Moses was eventually successful due to God in Exodus Chapter 12. If God was able to get Moses to fulfill his destiny, I am sure that He can do the same for you. Let’s remember that when the focus is on you and your destiny, God does not care what anyone may think or say about it because He has a purpose and calling for you to do. In the question section, I want you to give some serious thought to the questions above and share your answers and comments below. Your answers and insight can help yourself and other people understand that God has what it takes to launch you into your destiny, but it comes down to you doing your part and letting God have His way with you. I hope you have enjoyed this post as much as I have and I look forward to sharing more posts by Michael. And because you are sons, God has sent forth the Spirit of His son in your hearts, crying out, “Abba, Father!” Therefore you are no longer a slave but a son, and if a son, then an heir of God through Christ. I never fully understood what it meant when someone would say, “You are a child of God”. I would say, “Ok, so why is my life this way?” See, in my warped mind I thought he punished us for our sins instead of loving us. Sad right? Yes it is. I lived this way for years, not knowing He really did love me. See, I lost my mom when I was six and didn’t have a mother or a father really, even though he recently died just a few years ago. I had my siblings, who who cared for me throughout my childhood. I never had the relationship with a parent. That is, until I let God in. I struggled all my life and thought this is how it is supposed to be. I made my bed, so I had to lie in it right? Boy, was I wrong. In May of this year, did I truly know that God was the missing link in my life. He was my Father, He was all I needed. When I surrendered all to Him, everything changed and I saw how wrong I had been. He loved me, as horrible as I had been, as much as I had turned away from Him, as much as I had sinned…He loved and accepted me. We are all children of God, no longer slaves, but an heir of God through Christ. Now if that is not the best gift, I don’t know what is. I know He is all I need. He is all any of us need. He is the Way, the Truth, and the Life. From this Kingdom daughter to my Kingdom brothers and sisters, we are His, forever.